The way companies engage with their customers nowadays has completely changed since the Internet of Things (IoT) came onto the scene. Companies can no longer compete with each other only on products and prices in their attempt to attract more customers to their side. The market today is packed with similar goods and prices from numerous suppliers. The new challenge today is customer experience, which means that businesses need to step up their game, as it were, and provide superior experiences than those of their competitors. Customers today are expecting personalization at every touch point with the brand. Many organizations are struggling to deliver a single personalized experience across all of their channels. And as the physical and digital worlds are converging at a fast rate, personalization becomes an even more significant challenge for organizations. Nevertheless, personalization is crucial when it comes to delivering a quality customer experience. But the fact of the matter is that most companies have little to no knowledge of how to execute a proper and successful digital personalization strategy. The biggest struggle here is to identify the right metrics that can measure positive outcomes. According to several studies and surveys, statistics show that 69% of businesses rated personalizing the customer experience as their utmost priority. It was followed by acquiring new customers at 41% and the targeting of individual market segments at 36%. These numbers come as a result that 73% of consumers prefer doing business with companies that use personal information to enhance their own shopping experience. Likewise, 86% also say that personalization plays an imperative role in their purchasing behavior. It's also important to remember that 45% of online shoppers are more likely to make a purchase based on personalized recommendations, while 40% buy more from retailers who personalize their content. Surveys have also show that 80% of consumers enjoy brand emails that incorporate various products or offers that are based on their previous purchases. The most effective data-driven personalization tactics used by most marketers have targeted landing pages, email message personalization, web content personalization, and triggered email campaigns. As the most critical attributes of customer experience, fast response time to issues, needs, or complaints was cited as being on top with 75% of responders. The consistency of experience across all channels is in second place with 55%. Personalized recommendations were shown to drive impulse purchases by as much as 49%, with 85% of those being happy with their acquisitions. Only 5% of those purchases were ever returned. What's more, 40% of US-based consumers have said to have purchased more expensive items thanks to the personalized service they received. 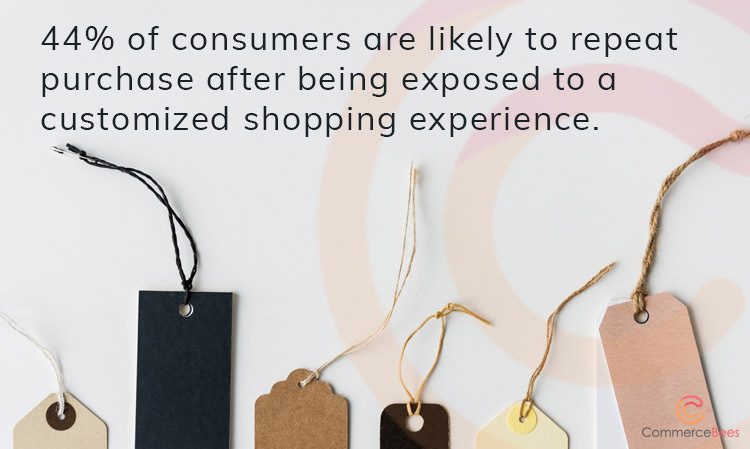 Probably the most critical part here is that 44% of consumers are likely to repeat purchase after being exposed to a customized shopping experience. And at a time when total retail sales are expected to reach $5.68 trillion by 2021, experts predict the businesses that invest in personalized customer experience are expected to see a cumulative $2.95 trillion in value. In other words, delivering a personalized experience to customers is quickly becoming the norm. Nevertheless, it doesn't mean that there is a unique formula or a one-size-fits-all approach to the issue. It is only by knowing your customers' wants and needs, their purchasing and overall behavior that you will be able to provide this high-degree of personalization. For more information about customer experience and the implementation of digital technologies, contact us today.